This year’s lentil recipe was a bit of a struggle to come up with. Inspiration just wasn’t striking and I really didn’t want to repeat any of the old standbys, so I went trolling through my ungodly quantity of cookbooks, sure I’d find at least something new and interesting. As I discovered, the sad fact is that lentils are a mile wide and an inch deep in the vegetarian cookbook universe. Everyone has the requisite take on lentil soup and mujaddarah, most have a burger or a loaf, and a few have a pate of some kind, and that’s about the extent of the creativity. The closest I got to something holiday-appropriate that I wanted to try was the lentil galettes in Yotam Ottolenghi’s Plenty, which really fancies things up with a puff pastry circle under a spicy yogurt-dressed salad of Puy lentils and fresh spinach, but that seemed more like a summer dish, and my head wasn’t really in that end of the Mediterranean anyway after briefly contemplating a Spanish-leaning version of the ubiquitous lentil stew. While the stew was too rustic (read: brown and dull-looking) for a holiday meal, smoked paprika did sound like a great accompaniment for lentils, and it also reminded me of a tomato “confit” featuring smoked paprika that I used to serve on bruschetta at parties. A puff pastry base, an olive- and rosemary-spiked mound of shiny Puy lentils, and a deeply smoky-sweet topping of concentrated tomatoes had definite possibilities. The resulting galettes were quite successful, the crisp decadence of the puff pastry balancing the softer, earthier textures and flavors of the lentils and tomatoes. 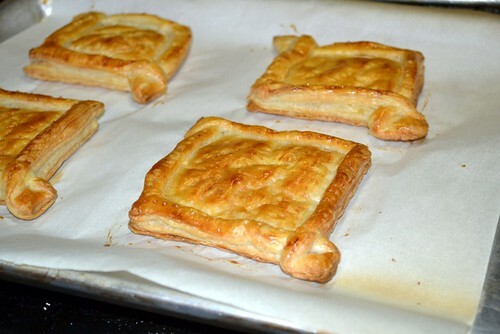 They’re clearly on the fussy party food end of things, and in fact if you cut the puff pastry into very small squares, it would make a fantastic hors d’oeuvre to serve with cava. Since you could really make all the components ahead of time and just warm them back up before assembly, though, it would be an equally good candidate for a brunch a little later in the year, after all the holiday fatigue has worn off and you feel like entertaining again. Cook the onion in 3 tablespoons oil in a 10-inch heavy skillet over low and cook, stirring occasionally, until onion is golden and soft, 8 to 10 minutes. Drain, seed, and very finely dice the tomatoes. Add the tomatoes, paprika, sugar, and salt to the softened onion and cook, uncovered, over low heat, stirring occasionally, until very thick, 25 to 30 minutes. Stir in the remaining tablespoon of olive oil, correct for salt as necessary, and cool to room temperature. Boil lentils with half of the minced fresh rosemary and the garlic clove until tender but not mushy. Drain the lentils and discard the garlic clove, then immediately dress with the olives, olive oil, salt, remaining rosemary and a shot of the sherry vinegar. Taste and add more salt and/or vinegar as needed. Cut the puff pastry into 4- or 5-inch squares, and if desired, further pretty it up by creating a twisted rim as demonstrated here. Place the squares several inches apart on two parchment-lined baking sheets and refrigerate for 30 minutes to firm the pastry up again. Preheat the oven to 400F, thoroughly dock the pastry with a fork to contain the puffing, and brush all exposed surfaces with the egg wash. Bake until risen, crisp and uniformly golden, around 10-15 minutes. Cool the pastry bases slightly before compiling the galettes. 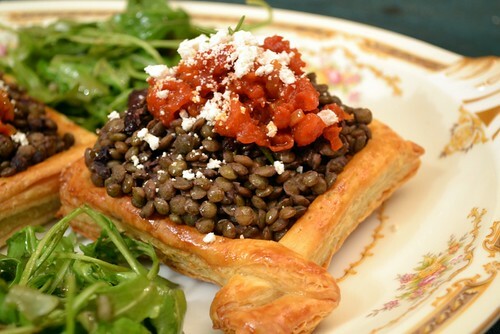 When ready to assemble, generously mound each puff pastry square with lentils, top with a spoonful of the confit, and garnish with a sprinkling of ricotta salata and a rosemary sprig. Serve immediately, with a lightly dressed salad of arugula or other peppery greens. 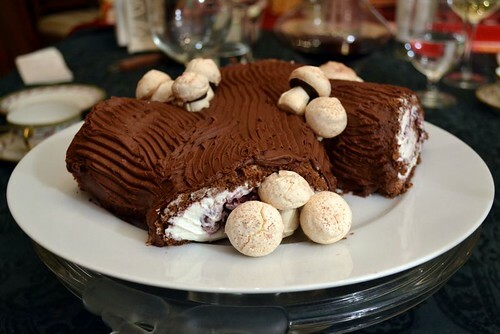 We have been having buche de noel as our Christmas dessert since I was a wee thing, originally having picked up the habit during our brief sojourn in Montreal before we moved on to California. Although there are a lot of versions of buche de noel kicking around, ours has been the exact same nearly all my life: chocolate genoise rolled around lightly sweetened whipped cream, covered in a cocoa frosting raked with a fork to simulate bark. It’s delightful, it’s tradition, the leftovers make an amazing Boxing Day breakfast, and for most of my life, I never even considered messing with it. Last year, though, I was feeling a little sacrilegious, and decided to see what a Black Forest variation would be like. I added a jar of sour cherries to the filling, and I brushed the cake with a syrup made from the cherries’ liquid fortified with sour cherry jam and kirsch. I loved the results, so this year I went even further over the top, finally getting around to making the meringue mushrooms that normally decorate the cake, but which we’d never bothered with. This cake is, I freely admit, a pretty massive production, which is why it’s a holiday activity. It involves at least a full day of work, and more likely two: the meringues the day before and the cake the day of serving. I know you’re not going to do this more than once a year, and you probably won’t do it at all, but if you do, believe me when I say it’s worth it. It’s fantastically delicious, and there’s nothing like the gloat factor from pulling off something that looks this impressive. If you do decide to make this Yule log over one of the remaining ten days of Christmas, one note about the meringues: they’re a mashup of a Jacques Torres and an Alice Medrich version, which is why that part of the recipe below is by weight in grams instead of volume. I may revise this post later to give measurements instead, but as long as you have a kitchen scale, the current version should work well for you. You can also scale the meringues down more easily with weights in grams, which you may want to do since you don’t really need anywhere near that many. I only made that big a batch because I had 5 whites left over from a batch of hollandaise, and I plan to take the many leftover mushrooms to work on January 2nd as a lighter offering for those coworkers who will insist on making New Year’s resolutions (bah, humbug!). Preheat the oven to 250F and line 4 baking sheets with parchment. Beat the 5 egg whites at medium speed in a standing mixer fitted with the whisk attachment until foamy, then start adding in the granulated sugar a tablespoon at a time. Increase the speed to medium high and beat until stiff and glossy peaks form, about 5 minutes. Lower the speed to low and whip 2 more minutes, stopping if the meringue starts to look dry. Gently fold in the confectioner’s sugar with a rubber spatula, and spoon the meringue into a pastry bag or gallon-sized zip-top bag fitted with a ½ inch round decorating tip. To make the mushroom caps, hold the piping bag just above the surface of the paper and squeeze the bag until the meringue forms a mound the size you want. Stop piping and skim the tip along the surface before lifting to prevent a peak from forming. Repeat with more caps, set an inch apart, until you have filled two of the sheets. To make the stems, hold the bag perpendicular to the sheet and squeeze a quarter-sized amount of meringue, then pull up to create a cone. (Don’t worry if the tips bend over, since they’ll be sliced off later anyway.) Make significantly more stems than caps, since you’ll need extras as insurance against breakage, etc. Lightly dust the caps with the cocoa and blow off the excess while holding the sheet over the sink. Bake the meringues at 250 F for an hour until firm and dry, lowering to 200 if you see signs of browning. Turn off the oven and leave to cool for another hour. When ready to assemble the mushrooms, melt the chopped chocolate in a liquid measuring cup in the microwave at low power in 30-second increments, stirring between zaps, until only a scattering of larger unmelted pieces remain. Use an immersion blender to finish the melting process and temper the chocolate, and set the measuring cup in a bowl of warm water to keep it liquid as you work. Spread a thin layer of chocolate on the bottom of a meringue cap, carefully saw the pointy tip off a corresponding stem with a sharp knife to create a flat surface, and stick the cut end into the chocolate, setting it back upside down onto the baking sheet until the chocolate has hardened and the halves of the mushroom are firmly stuck together. Repeat with remaining meringues, and store in airtight containers until ready to serve the cake. To make the soaking syrup for the cake, drain the cherries very well in a strainer set over a measuring cup, then set them aside for the assembly stage. In a small saucepan, combine their syrup with the cherry jam, and simmer vigorously until reduced by half. (My jar yielded about 1½ cups of syrup, which boiled down to ¾ cup). Cool briefly before adding the kirsch to taste, then leave to cool completely while preparing the cake. Preheat the oven to 350 F. Grease a standard rimmed baking sheet, line the bottom with parchment, and lightly grease and flour the paper. Spread the batter evenly in the prepared sheet pan, rapping it once firmly against the counter to pop any too-large air bubbles. Bake until the cake begins to just pull away from the sides and the top springs lightly back when pressed gently with a fingertip, approximately 15 minutes. Cover the surface with another piece of parchment paper and cool completely on a wire rack. Sprinkle a piece of parchment paper lightly with powdered sugar and invert the cake onto the sugared paper. Gently peel off the parchment the cake was baked in, tearing it off in smaller pieces if necessary to prevent the cake ripping. 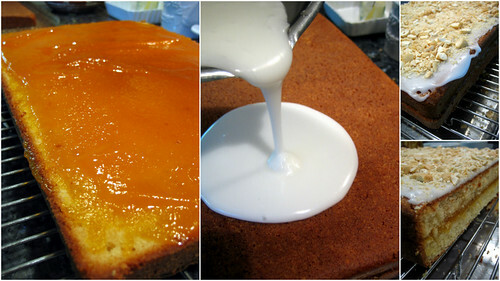 Lightly brush the surface of the cake with the syrup until moist but not soaked. Beat the cream with the sugar and vanilla until stiff and spread evenly over the surface of the cake, then dot the cream with the drained cherries. Using the parchment the cake is siting on to help you, roll the cake over the filling along the long edge, ending with the seam side down. With your knife at a diagonal, cut a piece several inches long off each end of the roll, to form the branches of the log. Carefully transfer the largest piece onto a serving platter, then set the end pieces on opposite sides of the “trunk”, cut sides facing out and staggered slightly to avoid unnatural symmetry. Cover the cake with plastic and refrigerate until it firms up, at least as long as it takes to prepare the frosting, but not more than a few hours. In a mixer fitted with the paddle, combine the sugar, cocoa and salt. Add the milk and vanilla and blend until smooth, then beat in the butter until a fluffy spreading consistency is reached, adding a little more milk if necessary. Frost the cake with a gentle hand to prevent any tearing the sponge, also avoiding the cut ends so that the cream filling doesn’t streak the frosting white. Using a fork or a cake comb, run along the frosting to create a bark-like effect. Cover again with plastic and refrigerate until ready to serve. 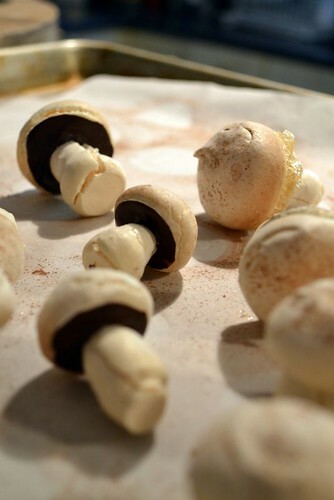 Just before serving, decorate the cake and its platter with clusters of the meringue mushrooms. Have extra mushrooms on the side to add to each plate as you serve slices to your guests. For a really helpful visual with tips on how to pipe and assemble the mushrooms, see this video featuring Alice Medrich. You will have plenty of cherry soaking syrup left over, which is a great addition to holiday cocktails or mixed with plain soda. If you would like it to be non-alcoholic, you could leave out the kirsch, since there will be plenty of cherry flavor even without it. Don’t be tempted to decorate the cake with the mushrooms too far ahead. They should be added just before serving so they don’t absorb too much moisture from the cake and go soggy. Any meringue mushrooms not used to decorate the cake or added to each plate when serving should be kept in airtight containers, where they will stay crisp for quite a long time. While I adore tomatoes in general, I have to say I’m not the biggest fan of the yellow varieties. They look beautiful, and they fit their Italian name (literally “golden apples”) better, but in my opinion they also tend to be mealy and weaker-flavored than their red garden-mates, lacking the acid to balance their sweetness properly. The cherry and grape varieties are better than the full-sized ones, tending to be less watery too. Still, apart from my best-beloved Green Zebras, I will always prefer red tomatoes. Nonetheless, I had a bunch of yellow ones on my hands this week because they were in my basket of mixed heirlooms, so I decided to just embrace the yellow by using them in a saffron-tinted risotto which also used the lovely fennel and shallots from the same market run. Though these particular fennel were young and fragrant, I find that cooking fennel really dulls the anise flavor, so I also added a good spoonful of fennel seeds to really get the point across, and also provide an occasional contrasting crunch to the creamy rice. In order to avoid similarly dulling the tomato flavor into nonexistence, I pureed the insides and used the tomato puree as the last addition of liquid to the rice, and only added the diced flesh off the heat, when you also stir in the cheese. 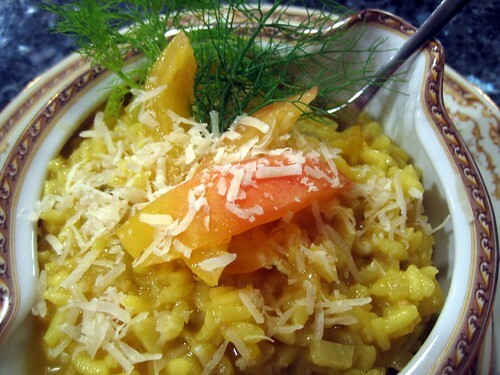 This risotto is a very nice vegetarian summer main course, and would also work well as a side dish with grilled meat or fish for your Labor Day barbecue. Add the top stalks and fronds of the fresh fennel to the stock in a medium saucepan and bring to a simmer. Keep it simmering while preparing the rest of the ingredients. Dice the bulb of the fennel and the shallots finely. Heat the butter and olive oil in a large nonstick sauté pan over medium heat until the butter has melted. 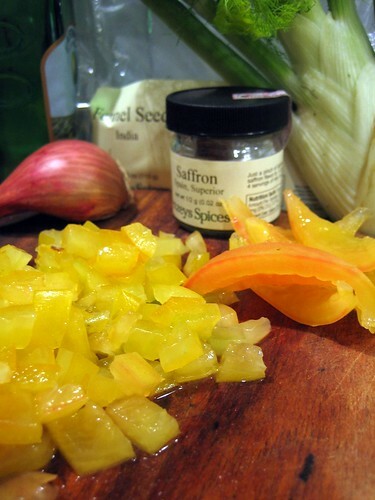 Sauté the diced fennel, shallots and fennel seeds until the vegetables are softened and turning translucent, then add the rice and stir well to coat each grain with the fat. Continue toasting the rice until it also begins to go a bit translucent, 3-4 minutes more, sprinkling in the saffron in the last minute or so. Pour in the wine and stir until it has absorbed, then begin adding a ladleful of the simmering stock at a time (leaving the fennel tops behind), waiting until the last addition has mostly been absorbed before adding the next. Stir occasionally to prevent sticking on the bottom, but constant stirring isn’t necessary. While the risotto is underway, slice the tomatoes in half and scoop the seeds and their surrounding flesh into a liquid measuring cup. Using an immersion blender, puree the tomato guts until uniformly liquid. Dice the hollowed-out tomatoes, and set aside. When the rice is creamy and only barely still chewy, stir in the tomato puree and continue cooking until any excess liquid has evaporated. Off the heat, mix in the diced tomatoes and cheese, correcting for salt as needed. Serve immediately, preferably in warmed bowls. Arborio, carnaroli or another Italian risotto rice will give you the creamiest texture and absorb all the yellow color best, but you really could use any short- or medium-grain rice, or even another relatively quick-cooking and chewy grain, like barley. Grains that take a very long time to cook, e.g. wheat berries, are probably not ideal, but if you have the patience, you’re welcome to try and let me know how it goes! This could easily be made vegan by using only olive oil at the beginning and leaving out the cheese at the end. Leftover risotto can just be reheated, but it would also be great as cakes, or if you’re feeling really intrepid, rolled around a core of cheese, coated in breadcrumbs, and fried as arancini. This is not New Year’s resolution food, at least not unless your goals for 2013 involve incorporating more carbohydrates and fat into your diet. But it’s February, so even setting aside my antagonism toward the whole concept of resolutions, you’ve all had over a month to compensate with whole grains, dark leafy greens, etc., in which case one rich pasta dish isn’t going to utterly corrupt you, or you’ve already fallen off the wagon and this bit of indulgence isn’t going to do any additional damage. 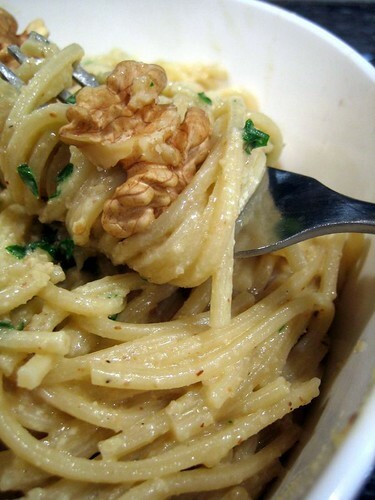 Beautifully silky, creamy and elegant, with the warmth of lightly toasted walnuts and the brightness of good extra-virgin olive oil, this walnut sauce is neither complicated nor time-consuming to prepare. 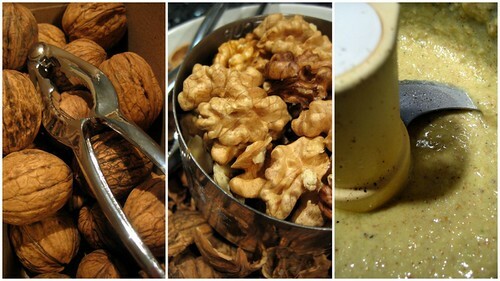 However, there is one catch, and it’s critically important to heed it: you really do need to make this with the freshest, highest-quality walnuts, because it will make the difference between a sauce that’s luscious nutty perfection and one that’s flat and dull or, even worse, bitter or rancid. My walnuts were backyard-grown, very recently harvested, and lovingly shipped to me from northern California by His Lordship’s cousin. The first time I made this, I did it on-site during a holiday visit with walnuts from the same source. If you’re not lucky enough to have a West Coast connection, either wait until locally-grown walnuts in season are available in your farmers market, or seek out the best vendor you can find, preferably get them still in the shell, and make sure to taste the nuts before trying this recipe. If they don’t taste fresh and mild and sweet, use them for a more forgiving sauce, like pesto. Slight post-facto edit: A rousing discussion with my Facebook friends made me think of a possible alternative if you can’t get really good walnuts. Pistachios still in the shell are readily available year-round just about everywhere, and would definitely work as an alternative. It will taste and look quite different, of course, but it should still give you the nutty, creamy unctuousness that’s the heart of this sauce. As a bonus, if you have children, it will be entertainingly green and you can tell them it will make them strong like The Hulk. Roughly tear up the bread and place it in a shallow bowl, pouring over the cream or milk. While it soaks, very carefully toast the walnuts in a dry pan over medium-low heat, tossing frequently to avoid burning, just until the nuts have barely started to turn golden and release a faint toasty aroma. Allow to cool briefly. 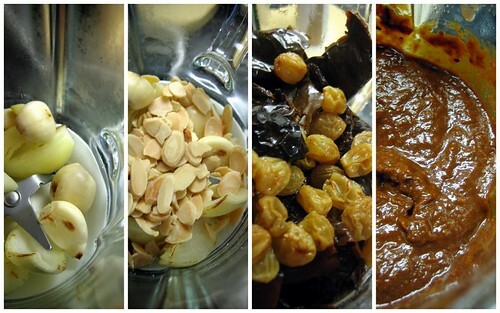 Place the nuts, garlic and cheese in a food processor and pulse a few times, until the nuts are broken up. Add the soaked bread and the liquid, with a hefty few pinches of salt and several grinds of pepper, and run the processor again until a paste forms. With the processor running, pour the olive oil down the feed tube and process just until you have a homogenous sauce that looks like a slightly grainy mayonnaise. Taste and correct the salt and pepper as necessary. Boil the pasta in very well-salted water until al dente according to the package instructions. When you drain the pasta, reserve a good cup of the pasta water and set it aside. Toss the pasta with the sauce and the parsley, adding as much pasta water as needed to thin the sauce to a creamy consistency that evenly coats the pasta and allows the strands to caress each other instead of clumping. Serve immediately in warmed bowls. All resolution-bashing aside, there are some things you can do to lighten this up just a teeny bit, although it’s never going to be exactly what your doctor ordered. You can use low-fat milk instead of cream, whole wheat pasta and multigrain bread (provided it’s not too dense and chewy), and cut back a bit on the cheese, or you could serve smaller portions as a side dish beside a suitably healthy protein and a very large salad. This would also work just fine as a vegan dish with non-dairy milk and omitting the cheese entirely, although in that case you’ll need to salt a little more aggressively, and you might want to toast the walnuts a tiny bit darker for added flavor. I’d also be tempted to add a very light grating of nutmeg for complexity. This is a perfect mid-week pasta dish for the rest of the year, since it comes together in about half an hour if you time it right, and you can substitute any white wine or even a dry hard cider, French or even plain old brown lentils, and essentially any sort of green vegetable. I was originally going to add broccolini, but it was missing from the crisper when I went to cook, probably because I added it to soup mid-holiday week and forgot. No matter, since the leeks worked fine, as would any leafy green or brassica. The only thing I’d recommend not messing with if at all possible is the fresh shiitakes, because they go so satisfyingly crackly at the edges when seared, and add so much meaty savoriness to the dish. Regular button mushrooms would not be quite the same. Cook the lentils in a small saucepan with sufficient water to generously cover until just tender, around 20 minutes. While preparing the sauce, set a large pot of water to boil for the pasta, salting it well once it has reached the boil. Add the pasta and cook to al dente according to the package instructions. In a large, non-nonstick sauté pan, heat 3 tablespoons of the olive oil over medium-high heat until shimmering, then add the shiitakes. Sear the mushrooms until deep golden and crisping around the thin edges, adding a bit more oil if the pan gets too dry. Remove the mushrooms but don’t worry about any brown bits that cling to the pan. Add the remaining oil to the pan, lower the heat to medium, and add the leeks. Sautee until they begin to brown a bit, then deglaze the pan with the champagne, add a generous amount of salt and pepper, and simmer until the champagne has mostly reduced away. Add the lentils and taste, correcting seasonings as necessary. Drain the pasta, reserving about a cup of the pasta water. 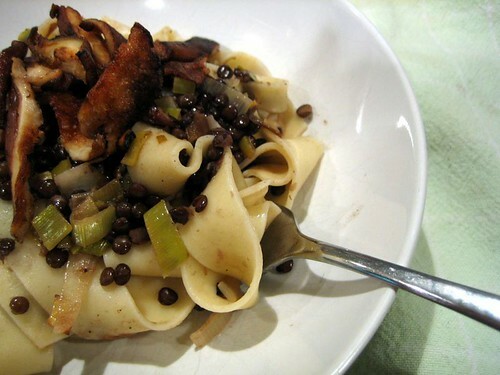 Add the pappardelle to the pan and toss with the lentils, loosening it with the reserved pasta water as necessary. 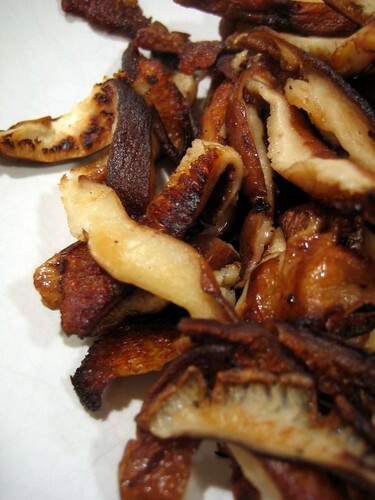 Serve in warmed bowls with a quarter of the seared mushrooms mounded on top. If using fresh pasta instead of dried, you’ll want to double the quantity by weight. Also, if you don’t use leeks, I’d throw in a couple of cloves of minced garlic along with your green vegetable of choice. It’s important not to use a nonstick pan because you want to be able to use high enough heat to sear the mushrooms properly, and you also want to be able to scrape up all the yummy browned bits when you deglaze with the champagne. That’s a provocative statement, I know, but what else are you going to call a buttery coffee cake pierced by a bright red layer of cranberries and sprinkled with a cinnamony walnut streusel? It practically screams “Ho ho ho!” at you, and on top of being so blatantly festive visually, it’s also pretty quick and easy to put together and feeds an entire phalanx of revelers. As a bonus, the cranberry filling drains off about a cup or so of a stunningly crimson, sweet-tart syrup that can be mixed into your favorite punch or cranberry cocktail recipe, or mixed with iced tea if your occasion isn’t quite so adult. Cake and drinks should get you all through First Night and whatever lentil recipe I come up with for 2013, right? Pulse the cranberries and 1/3 cup sugar in a food processor just until finely chopped, being careful not to carry it over into a puree. Set a fine-meshed strainer over a large liquid measuring cup and scrape in the cranberries, and allow them to drain for 15 minutes. In a medium bowl, stir together the walnuts, sugar, cinnamon and melted butter. Set aside. Preheat the oven to 350 F and line a 9 x 13 rectangular cake pan with parchment paper, leaving a slight overhang to help you lift the cake out later. Whisk together the dry ingredients for the cake in a medium bowl. Do the same in a glass measuring cup with the buttermilk, melted butter, walnut oil and vanilla extract. In a large bowl, beat the sugar and eggs together until frothy. Add the dry and wet mixtures in two additions each, starting with the flour, and stirring just until mixed before the next addition. Stir a third of the walnut streusel mixture into the drained cranberries, reserving the cranberry syrup for later use. 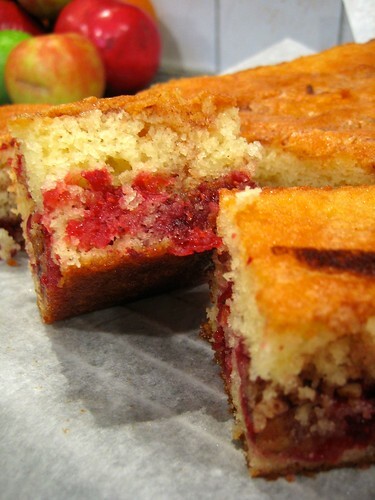 Spread half the cake batter into the prepared pan, then sprinkle in the cranberry filling, leaving a clean ½ inch border of batter all around the edge. Smooth the remaining batter over the top, and sprinkle the top with the rest of the walnut streusel. 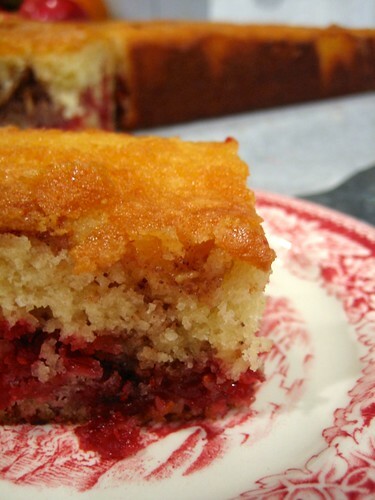 Bake for 45 minutes, or until the top is golden and springy to the touch and a tester inserted through the cake comes out clean except for any clinging bits of cranberry filling. Cool the cake completely in its pan on a wire rack, then lift it out using the parchment overhang. Use a serrated knife to divide into slices 1 to 1 ½ inch thick or slightly bigger squares. If you don’t have a party to take this to, you can halve the recipe, although in my opinion you might as well make the whole thing and freeze the leftover slices, tightly wrapped in plastic wrap in bundles of two slices and then placed in a zip-top bag. They defrost with just a quick 30-second zap in the microwave, supplying you with instant cake straight through the post-holiday doldrums. If you don’t have walnut oil, you can just substitute an additional ½ stick of melted butter. In that case, you could swap out the walnuts for pecans, if you prefer. I think, as of this year, I can safely say I’ve covered the whole universe of apple pie. I’ve done all manner of tarts, tatins, single-crust pies, and traditional double-crust pies, and now I can add fried pies, which was His Lordship’s birthday request this time around. Because no fried apple pie recipe had every quality I was looking for, I mashed together and made further changes to this recipe for the pastry and Shirley Corriher’s recipe in Cookwise for an apple pie in which the filling, top and bottom crusts are all cooked separately and assembled at the last minute to keep the pastry from going soggy. I mixed the apples (Stayman, Cortland, York and Honeycrisp) for a nice balance of sweetness and tartness, and a blend of firm pieces and almost-melting ones. 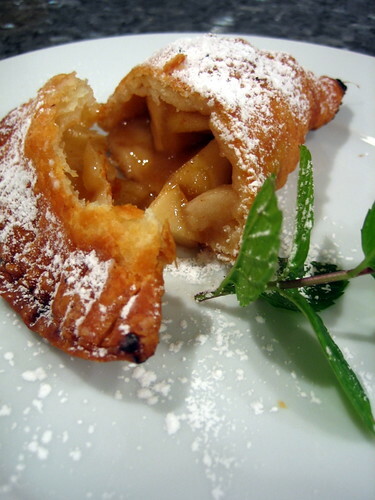 To further bump up the apple flavor, I used a blend of apple cider and Calvados in the filling. The resulting pies are really good, blisteringly crisp outside and oozy-apple-y inside, although I’m not going to kid you; they’re a fair amount of work and not remotely speedy to prepare. Still, once a year, you might as well really do it up right, right? In a large bowl, whisk together the flour, baking powder and salt. 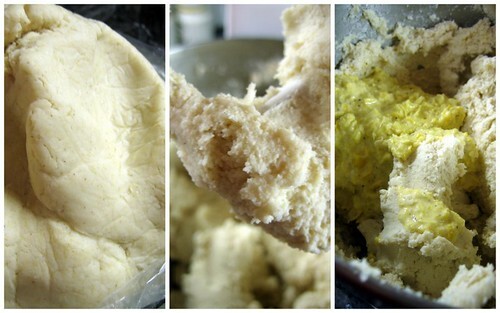 Add the butter and shortening and work with a pastry blender until the mixture resembles a coarse meal. Whisk the egg with ¼ cup of the ice water, sprinkle over the dry ingredients, and stir gently until fully incorporated. Add more water as necessary until the dough holds together, kneading a few times in the bowl to be sure. Divide the pastry in half, press into disks, and wrap tightly in plastic wrap or in zip-top bags. Chill at least one hour. 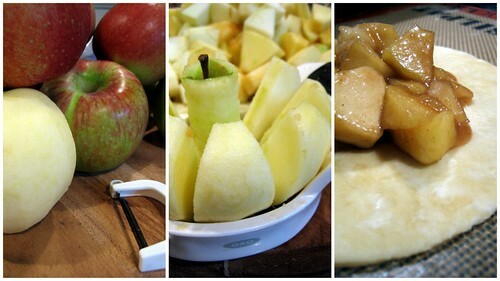 Peel the apples and divide into segments with an apple corer/slicer. Further chop each segment into ½ inch chunks. Melt the butter in a large skillet over medium heat and sauté the apples 2-3 minutes, stirring gently with a heatproof spatula. Add the ¼ cup cider, Calvados and vanilla and cook 1 minute longer before adding in the sugars, spices and salt. Simmer the apples until starting to become tender but not mushy, 5 or so minutes more. Add the cornstarch mixture and continue simmering until the juices have thickened. Cool the filling completely and refrigerate until ready to assemble the pies. Roll a disk of the pastry on a lightly floured surface to a thickness of about a quarter inch. Cut six-inch circles from the dough, laying the circles in a single layer onto parchment-lined baking sheets. Refrigerate until firmed up again. 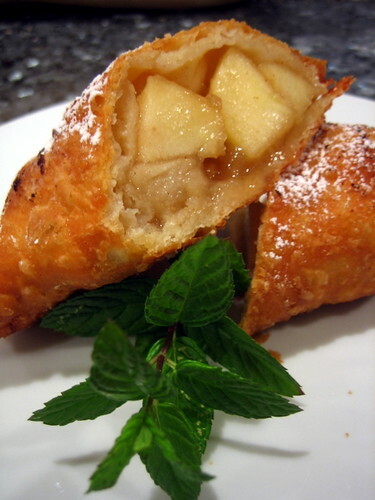 Place two heaping spoonfuls of the apple filling in the center of a pastry circle. Brush the edges with water, fold in half, and pinch to seal closed, pushing out any air as you go along. Place the filled pie back on the parchment-lined sheet and crimp the edges with a fork. Repeat with remaining circles. Chill again, until the pastry is cold and the pies are easily picked up. Heat 2 inches of oil in a heavy, high-sided pot to 360 F. Fry two to three pies at a time, turning once, until well browned. Drain on a rack set over a baking sheet until cool enough to handle. Dust with confectioner’s sugar before serving. Don’t be tempted to skip the re-chilling steps with the pastry, because the non-hydrogenated shortening really needs to be kept as cold as possible or it will be too floppy to handle easily. There will be both extra filling and dough scraps. You can re-roll the scraps for more pies, although the second batch will be tougher so I don’t bother. The leftover filling is a nice topping for waffles or pancakes, or can be served as a compote with yogurt. On the off chance that my prior Wednesday night baklava, candy making adventures, or Sunday layer cake baking haven’t convinced you that I’m a wee bit off my rocker, this really ought to do the trick. How many people go on impromptu solo tamales-making binges, I ask you? Tamales are the sort of thing that generally involve tons of planning and the rallying of an army of assistants, but I decided at lunchtime on New Year’s Eve eve not just to make tamales, but to start by making mole as the sauce first, which is normally considered a whole-day, once-a-year, multi-abuela job all on its own. But the thing is, even rationally accepting how insane the idea was, I still had to do it, because while on a shopping excursion on Friday, I finally stumbled on a place in this generally foodie-positive but sadly Mexican-ingredient unfriendly city that sold fresh masa. I hadn’t had really good tamales since my last California trip, this time last year, so finally having the proper ingredients on hand, I was going to do it up right, damn it. Since it was also nearly New Year’s, I was also going to incorporate lentils somehow, as has been my habit for the past decade or so. Tamales really are a ton of work and time, so I don’t expect anyone to try this particular recipe any time soon, but if you don’t have a ready source of really fantastic tamales, I seriously think these are worth the trouble once a year. They’re sweet and spicy and scrumptious, not to mention colorful, comforting, and festive, and unless you’re actually having them in the context of a tamales-making party, you should have at least a dozen tamales and at least a cup of mole to stash in your freezer for a few lovely effortless meals later on. Stem and seed the chiles, then toast them in a dry pan over medium heat until pliable, flipping often to prevent any browning. Put the toasted chiles in a large bowl or measuring cup with the raisins, cover with boiling water, and soak for 20 minutes. Toast the onion and garlic in the same dry pan until beginning to darken slightly on each side. Place the onion and garlic in the carafe of a blender with the drained chiles and raisins and a few tablespoons of the vegetable broth. Blend until smooth, adding more broth as needed to keep the blender running. Add the tomatoes, salt and pepper and blend again. Heat the oil in a medium pot with a heavy bottom and high sides, and fry the sauce for five minutes, stirring regularly. Add the chocolate, spices, sugar, and remaining broth, lower the heat, and simmer uncovered for 30 minutes, stirring occasionally to avoid scorching along the bottom and sides. Set aside to cool while preparing the rest of the tamale components.. While the chiles for the mole are soaking, preheat the oven to 425 F and line a baking sheet with aluminum foil. Peel the sweet potatoes, then halve them and cut into 1-inch slices. Toss them on the baking sheet with just enough oil to lightly coat them, and bake until cooked through and starting to caramelize on the bottom, around 30-45 minutes. Let cool slightly, then cut into chunks of about half an inch. At the same time, boil the lentils with ample water to cover until they are tender but not falling apart. Drain the lentils and set aside while making the masa. In the bowl of a standing mixer, cream the butter and/or shortening until light. Scrape down the sides and, with the mixer running, slowly add the masa by the spoonful and continue beating until fluffy, about another 10 minutes. With a food processor or immersion blender, puree the corn and cream or stock, then whip into the masa with the salt and pepper. Cover the bowl with plastic wrap to prevent the masa from drying out. Unfold the banana leaves and rinse the powdery residue off. If they’re not already cut in half, remove the center vein from the leaves and cut into two long strips with a pair of kitchen shears, then cut each leaf strip into 10-inch rectangles. Steam the leaves in a large steamer until they’re pliable. Tear a few of the less nice leaves, or any that have torn while processing, into ribbons for tying up the tamales. Lay down a steamed banana leaf square on a work surface. Using an ice cream scoop, portion out a ball-sized scoop of masa, and press it into a 6-inch circle in the middle of the leaf. 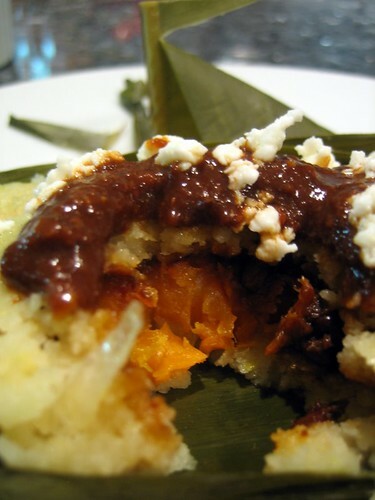 Over the center of the masa, pile 2-3 pieces of roasted sweet potato, a small spoonful of lentils, and a spoonful of mole. Using the bottom edge of the leaf, flip over about a third of the masa over the filling, then lay the leaf flat again. Starting at the top edge, flip over the other edge of the masa to seal in the filling, then keep rolling to enclose the tamal completely. Fold under the two open sides until they meet underneath the tamal, and use a strip to tie it securely shut. 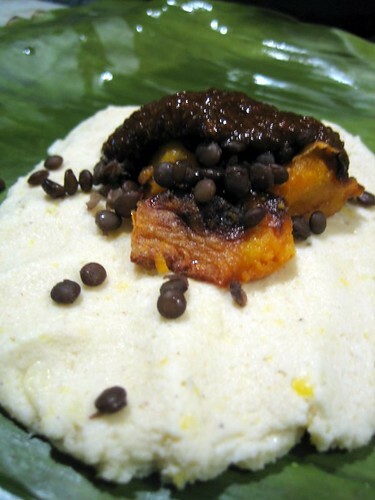 Lay the finished tamal on a cookie sheet and continue forming tamales until the masa runs out. Lay a few of the leftover banana leaves on the bottom of a large steamer over simmering water, and fill with the finished tamales. Cover with a few more leaves, and steam for about 1 hour, adding water to the bottom as necessary. Tamales are done when the leaf pulls cleanly away from the masa. Let rest for a few minutes before serving with the remaining mole on the side. Leftover cooked tamales will keep in the fridge for a few days and reheat well in the microwave, or they can be frozen immediately after folding and steamed later. If you can’t find a source of fresh masa, you can substitute the equivalent amount of reconstituted masa harina, which should be available in most supermarkets. It won’t taste quite as sweet and lovely as fresh masa, but it should still be good, especially when livened up with the pureed sweet corn. 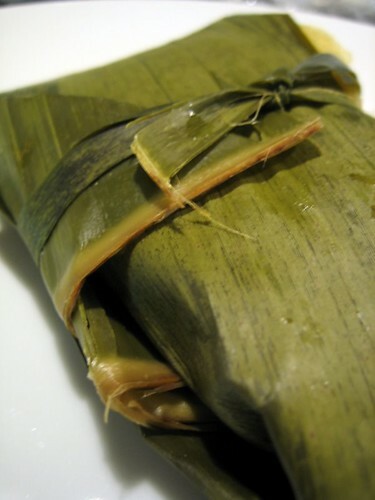 I used banana leaves rather than corn husks as the wrapper because I could easily get the leaves at the Asian market a block away from the tortilleria that sells the masa. Tamales are traditionally made with either of those wrappers in the various parts of Mexico and Central America, so use whichever you prefer. They will each impart a slightly different flavor to the tamales but will work equally well. Palm sugar, like the banana leaves, is commonly found in Asian markets. It’s less sweet than cane or beet sugar and has a wonderful rich caramel flavor, similar to maple sugar, which you could also use. If you don’t have either one, light brown sugar is more than fine, but start with the smaller amount and taste before adding more, because it’s significantly sweeter. We’ve already established that I’m frequently overly ambitious on a rainy Sunday, and sometimes I’m just stupidly excessive. This cake is the product of one of those stupidly excessive times, or perhaps two of those times, if you count the fact that I put up the mango butter that ended up as cake filling on a similar Sunday about two months earlier. 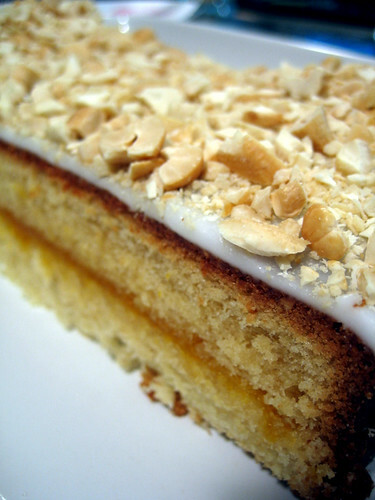 I’d been thinking for quite a long time about combining cashews and mangoes in a cake, since mangoes and cashews are close botanical relations and natural partners the same way almonds and apricots are. It’s so logical to pair them that I was really rather surprised at the dearth of cake recipes featuring them when I went a-Googling. There seem to be a lot of cashew-mango cheesecake and upside down cake recipes, but I actually rather dislike cheesecake (shocking that there’s cake I don’t like, I know) and wanted a proper layer cake for my Sunday afternoon tea. Since I couldn’t find what I wanted, I decided to adapt the recipe for almond cake that ended up as my birthday cupcakes last year. I was, I have to admit, a wee bit apprehensive about how the cake would turn out, given that cashews are higher in fat and waxier than almonds. I was worried they might behave weirdly in the cake and make it dense or grainy, but it turns out I had no cause for concern. The cashews melted right into the batter and the baked cake was just as wonderfully tender as it was with almonds. I even think the extra richness of the cashews might have slightly bumped up the butteriness of the cake, which, as I suspected, went beautifully with the brightness of the mango butter. To keep things really simple, I iced the cake with a very plain powdered sugar icing with just a hint of lime, and I covered the top with some more roasted, chopped cashews. I made a huge rectangular cake because I have a largish workplace and have to make sure everyone gets their Monday treat, but you could cut all the quantities in half and make a 9-inch round cake for your tea party. 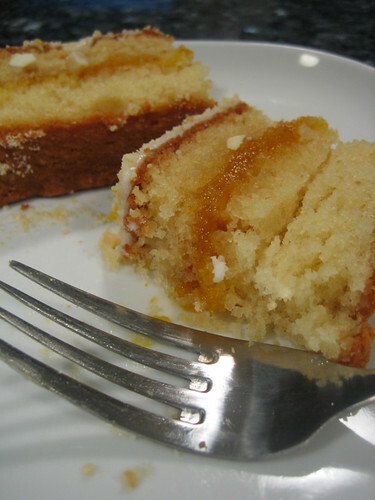 Earl or Lady Grey would work especially well given the citrusy undertones of the mango butter, but any kind of tea should be lovely with this cake. If you’re in an even more stupidly excessive mood and more inclined to fancy decorating than I ever am, I’d venture to say that this would make quite a lovely and unusual wedding or other special-occasion cake. You could even go full-bore tropical by incorporating coconut into the buttercream or fondant and surrounding the layers with white or pale yellow orchid blossoms. Preheat oven to 350 F. Butter a 9 x 13 rectangular cake pan and line the bottom with parchment paper, then re-butter and flour the pan. In a food processor, pulse 1 cup of cashews with 2 tablespoons sugar until finely ground, but be sure not to process so long it turns into cashew butter. Measure out ⅔ cup plus 1 tablespoon of the ground cashews and reserve the rest for decorating the cake. In a large glass measuring cup, whisk together the eggs, vanilla extract, and ⅓ cup of the sour cream. In the bowl of a standing mixer fitted with the paddle attachment, combine the flour, ⅔ cup plus 1 tablespoon ground cashews, 2 cups sugar, baking powder, baking soda and salt. Briefly mix on low to blend the dry ingredients. Add the butter and remaining sour cream and mix on low until combined, then increase the speed to medium and beat for 1 ½ minutes to lighten the batter. Scrape down the sides and add the egg mixture in 3 additions, scraping the sides and beating for 20 seconds between each one. Spread the batter evenly in the pan, flattening the top. Bake for 45-50 minutes, until the top is lightly springy and a toothpick inserted in the middle comes out clean. Cool in the pan for 10 minutes and then invert onto a rack to cool completely, pulling off the parchment. Once the cake is cool, split into two layers with a serrated knife. Carefully slide off the top half and spread the exposed lower half evenly with the mango butter. Replace the top half, making sure the edges line up properly, and smooth out any of the filling that dribbles out the sides. Whisk the powdered sugar, lime juice and water in a medium bowl until a thick paste forms. Place the bowl over a saucepan of simmering water and continue whisking until the icing warms up and the sugar has dissolved completely, about 1 minute. Immediately spread the icing in a smooth layer over the top of the cake, and sprinkle first with the reserved ground cashews and then with the chopped cashews. Gently press down a bit to cement the cashews into the icing. Let the cake sit for 15 or so minutes for the icing to firm up, and then slice with a serrated knife to serve, wiping the cake crumbs and mango filling off the knife between cuts for clean slices. The cake should keep well for about a day at room temperature. To keep it longer, tightly wrap the filled but not iced cake in plastic and refrigerate or freeze, decorating it shortly before serving. To make a normal-sized cake for 8-12, cut all quantities in half and bake the batter in a 9-inch round or springform pan for 35-45 minutes. It could also be divided among lined cupcake tins for about two dozen cupcakes. If you don’t have pre-roasted cashews, spread 2 cups raw cashews on a cookie sheet and bake at 350 for 10-15 minutes, until evenly dark gold, checking often to avoid burning. Cool completely before grinding half of it with the 2 tablespoons sugar in the food processor. I made my own mango butter shortly before I made the hurricane plum jam, because I had half a case of them getting ready to turn when I got back from a weekend trip. It would be far more sensible for you to use store-bought, but I’d suggest adding about ¼ teaspoon of ground cardamom and the juice of an orange to the butter and gently heating it until the dusty raw cardamom flavor cooks out and the extra liquid evaporates. If you’re not a mango fan, apricot or peach butter would also go quite nicely with the cashew cake and give you the same pretty color contrast. In case you’re wondering, the reason to bother with the whole double boiler business with the powdered sugar icing is that it helps it set up quickly. If you just mixed in the liquid and poured it over the cake, it would flow right down the sides after barely covering the top, not leaving you enough structure to embed the cashews in afterward. Because it does set up VERY quickly, be sure to have the cashews at hand for pressing into the top when you start to spread the icing. If you don’t want the hassle at all, the cake is still yummy, if slightly less pretty and more mildly cashew-flavored, without the decoration. …aaaand I didn’t give a reindeer’s fluffy behind, honestly. I have zero holiday spirit this year. Literally zilch, zip, nada, rien, nichts. There are no lights or ornaments up, no stockings have been hung with care, and I’m planning on spending the majority of my Christmas Day getting acquainted with TSA measures and enjoying all the other delights of trans-continental air travel these days. The Grinch ain’t got nothing on me. But since I can’t let the year ring itself out without one more blog post no matter how Scroogey my outlook, I would like to share a recipe that just might make your heart grow two sizes, should you need a no-fuss showstopper of a brunch or dessert item between now and Twelfth Night. I whipped it up during my November novel writing-related insanity, so if I say you can do this one with only half a functional brain, you can take my word for it. As is my wont this time of year, I had bought a panettone before Thanksgiving, but since it’s just me and His Lordship, I quickly sated my eggy, fruity cravings and still had a little over a quarter of the loaf left, forlornly sitting in its box. 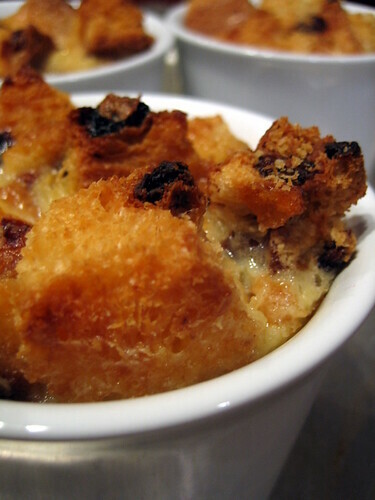 I thought about making French toast, which is a perfectly lovely application for leftover panettone, but decided bread pudding would be even better. I adapted an America’s Test Kitchen recipe and made four individual puddings in the high-sided ramekins I picked up at IKEA some time back, and have found a bazillion uses for since. And then, because I’m me, I also decided that a salted caramel sauce would make it even more inspirational to my writerly efforts, and modified Nigella Lawson’s quick butterscotch sauce to fit the bill. 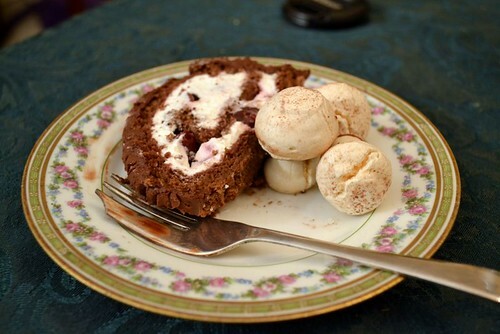 The puddings, I’m not ashamed to say, are stupendous. The custard is neither too eggy nor too sweet, and the bread absorbs just enough of it to stay airy and light without going mushy. The bits that stick out the very top get lovely and crispy, while the dried fruit in the panettone stays moist and chewy. You could leave off the sauce if you like, and as His Lordship did, but I think it adds both elegance and a nice intensity to contrast with the soothing softness of the pudding. So there you have it, my little Cindy Lou Whos. I may have a raging case of the bah humbugs, but you can’t say I didn’t deliver any holiday cheer. Ho, ho, ho! Move the oven rack to the lower-third position and preheat oven to 325 F. Generously butter 4 large, high-sided ramekins. Spread the panettone cubes in a single layer on a baking sheet and bake 5-7 minutes to dry them out a bit, removing immediately if they start showing signs of browning. Divide the panettone evenly between the ramekins and set back on the sheet. In a large measuring cup, whisk together the eggs and sugar until well combined, then blend in the milk, cream, bourbon, vanilla and salt. Pour a quarter of the custard mixture into each of the bread-filled cups. Bake the puddings 30-35 minutes, until golden brown on top and rising up in the cups, and just barely jiggly when shaken. Set aside to cool to just warm while making the sauce, or cool completely and refrigerate for later. 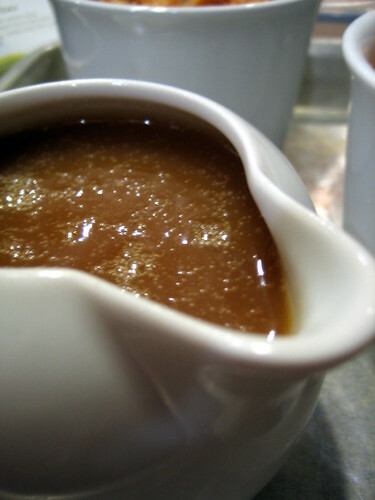 To make the sauce, combine the butter, sugars and golden syrup in a small, heavy pan and melt together over medium heat. Allow to simmer enthusiastically for 5 minutes, then remove from heat and stir in cream, vanilla, and salt. Stir well to melt the salt, then decant into a pitcher. 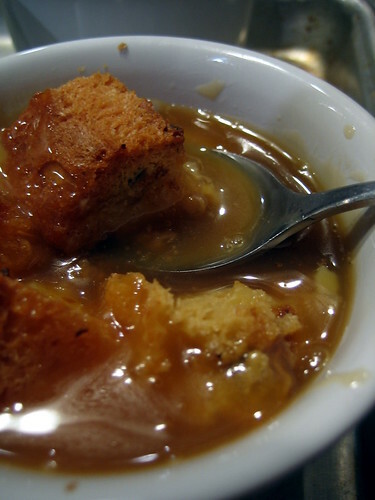 This recipe can be scaled up easily to accommodate however much leftover panettone you have. Should you not have any leftover panettone (though why wouldn’t you, since they’re everywhere now and will be everywhere and on sale after the holidays? ), you could use raisin challah or brioche instead. If you can’t find Lyle’s Golden Syrup, you could substitute light corn syrup or honey. Likewise, if you don’t have Maldon salt, another good-quality coarse sea salt will do.